Within about seventy-five miles of downtown Houston, some 1,500 miles of rivers, creeks, lakes, bayous, and bays await discovery. Canoeing and Kayaking Houston Waterways, by longtime paddler Natalie Wiest, is the perfect companion for anyone who wants to experience Houston’s well-watered landscape from the seat of a kayak or canoe. Before introducing readers to the quiet, green world that lies within and around the heart of the city, Wiest gives some pointers on water safety (including swimming and boating); on weather, flood stages, and legal access; and on an often unseen but always present paddling companion—alligators. She also provides a gear checklist for a day trip, a brief guide to boats and paddles, and a “sampler” list of easy places to paddle for true beginners. Presented in nine chapters, each organized around a river system or coastal basin and comprising a “suite” of paddling trips, the excursions described by Wiest offer a general description of the destination, directions (both driving and paddling), and details about the paddling conditions and access sites, which are all publicly owned or managed. Each chapter lists mileages, USGS gauging station numbers, and GIS locations when applicable. 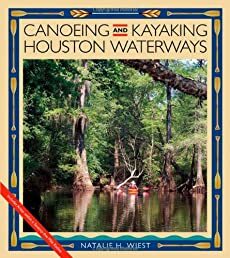 Also including ninety color photos and more than thirty detailed maps, Canoeing and Kayaking Houston Waterways offers both novice and experienced paddlers a helpful and enjoyable reference for experiencing nature at water level, in and around Houston.